The new heavy-duty RL-8500XLT combination brake lathe from Ranger features an extended capacity spindle and can turn a drum that’s up to 254 mm deep. The longer spindle and the relocated rear bushing provide the RL-8500XLT arbor with enough support to handle your heaviest drums, rotors and flywheels. 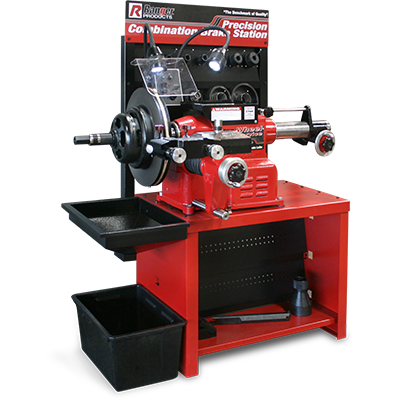 The RL-58500 brake lathe has been a staple of ours since it was introduced 40 years ago, so we figured it was time we added the RL-8500XLT as a heavy-duty model of the same design. The XLT model retains the simplicity, speed, precision and durability you expect from Ranger. This brake lathe just might outlive you (if that isn’t scary to think about). It includes a twin-cutter tool head with micrometer dials, quick drum-to-rotor changeover, adjustable speed settings that allow for quicker rough cuts (or slower smooth cuts) and an infinitely adjustable spindle-feed gear box with a variety of speed settings. Plus, our negative rake tooling yields one-pass finish cuts every time, and the standard 25 mm arbour provides many tooling/adapter options. Finish-cuts are guaranteed to meet or exceed factory specifications. Micro-dial twin tool cutter, boring bar, inside floating adapters, self-aligning spacer, outside floating adapter, centring cones, spacers, double-taper adapters, hubless adapters, carbide cutting tools, 6-sided carbide cutting inserts, 25 mm arbour, arbour nut, back load spring, spare bulb for lamp, illustrated instruction manual, wrenches, high-impact anti-vibration bands, storage case and more all come standard with a Ranger brake lathe. The Ranger brake lathe truck adapter set contains a 48 mm arbor, as well as other adapters. We’re not messing around: the adapter set is massive and lets you handle the brake service needs of every vehicle that rolls into your shop, including commercial flat-bed trucks.